The Andromeda Galaxy also known as Messier 31, M31, or NGC 224, is a spiral galaxy approximately 780 kiloparsecs (2.5 million light-years) from Earth, and the nearest major galaxy to the Milky Way. 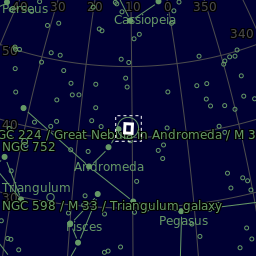 Its name stems from the area of the sky in which it appears, the constellation of Andromeda. While earlier findings suggested that the Milky Way galaxy contained more dark matter than Andromeda, and that it could be the largest in the Local Group - the 2006 observations by the Spitzer Space Telescope led to the revelation that the Andromeda galaxy contains one trillion stars; at least twice the amount of the Milky Way’s estimated 200-400 billion stars. 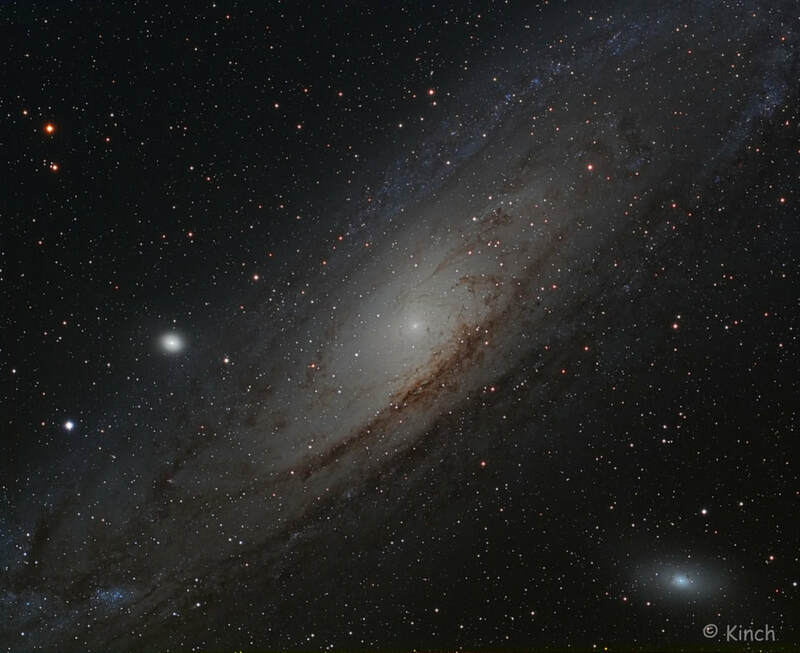 It is also now evident that spanning approximately 220,000 light years across, Andromeda is the largest galaxy in our Local Group, which is also home to the Triangulum Galaxy and other minor galaxies. The mass of the Andromeda Galaxy is estimated to be 1.5×1012 solar masses, whereas the Milky Way's mass is estimated to be 8.5×1011 solar masses. 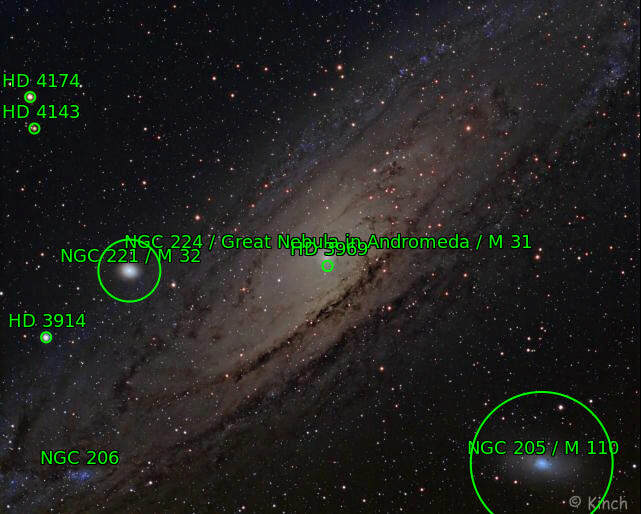 The Milky Way and Andromeda galaxies are expected to collide in ~4.5 billion years, merging to form a giant elliptical galaxy or a large disc galaxy. With an apparent magnitude of 3.4, the Andromeda Galaxy is among the brightest of the Messier objects - making it visible to the naked eye on moonless nights, even when viewed from areas with moderate light pollution. 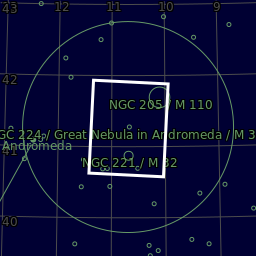 In 1785, the astronomer William Herschel noted a faint reddish hue in the core region of Andromeda. He believed Andromeda to be the nearest of all the "great nebulae", and based on the color and magnitude of the nebula, he incorrectly guessed that it is no more than 2,000 times the distance of Sirius. In 1850, William Parsons, 3rd Earl of Rosse, saw and made the first drawing of Andromeda's spiral structure. In 1887, Isaac Roberts took the first photographs of Andromeda, which was still commonly thought to be a nebula within our galaxy. Roberts actually mistook Andromeda and similar spiral nebulae as solar systems being formed. In 1912, Vesto Slipher used spectroscopy to measure the radial velocity of Andromeda with respect to our solar system—the largest velocity yet measured, at 300 kilometres per second (190 mi/s). I went to a dark site to take the subs for this image. My first time imaging away from home. I had all the gear prepared and battery charged but disaster struck just about midnight. A fuse blew on the DC splitter and I lost all power to mount, camera etc. You will note from the information below that I actually only got 1 minute of luminance data and the RGB is very unevenly acquired. I never thought I would make an image out of what I did manage to capture - but I am happy that I got some good detail in the image and that overall it is probably quite acceptable. Astrodon L 20 x 1" + 4 x 10"
Astrodon R 15 x 60"
​Astrodon G 90 x 30"
​Astrodon B 60 x 30"
Integration: 1 Hours 30 mins. Center (Dec, dms):+41° 15' 20.005"